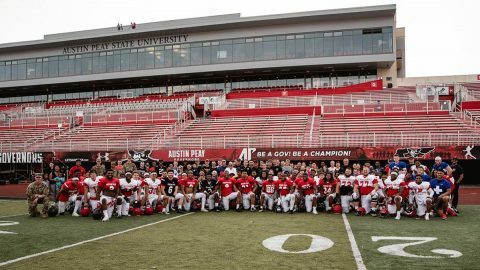 Clarksville, TN – Hard to believe, but it’s already been five weeks since the Austin Peay State University (APSU) football team began the first of 15 spring practices. 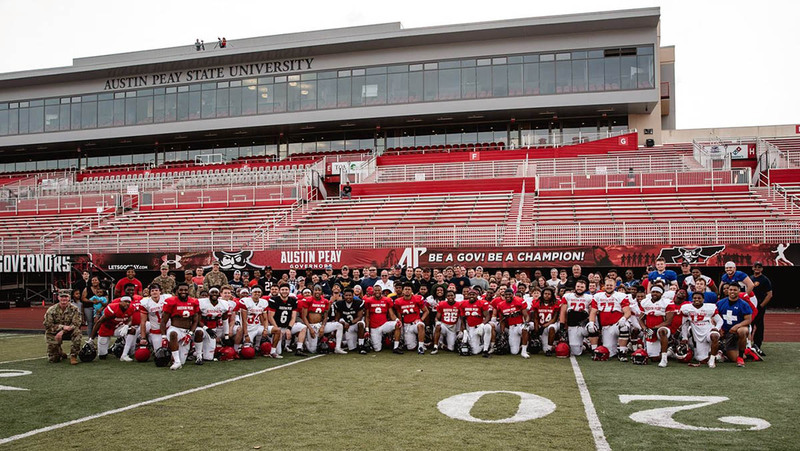 Thursday evening, April 11th, 2019 the Govs put a bow on their spring practices, marking the last time they will have full-on practice until fall camp begins in August. Thursday marked the final practice of spring ball for the Governors, and it started with a special welcome to members of the military stationed at Fort Campbell and first responders from the area who joined the team for its final tune-up before the summer. Though the plan had initially been to cap spring ball with the Red and White Spring Game, the spring game got moved up earlier and allowed the Govs to have three more practices to look at game-speed reps and make any corrections. Practice ended in celebration as Hudspeth let the team know that Friday’s scheduled workouts were canceled as a reward for the hard work all spring. Speaking of recognition for hard work, prior to the Red and White Spring Game, the coaches voted on the most valuable and most improved players on the field and in the weight room. The players also got an opportunity to vote for who has stood out to them to be the 2019 team captains. They chose offensive lineman Kyle Anderton, safety Juantarius Bryant, quarterback Jeremiah Oatsvall and linebacker Pat Walker.